Salvador Dali’s Parisian hotel of choice hasn’t lost an ounce of its panache over the years. After all, at Le Meurice, even the regulars can’t help but feel a bit awestruck. This Grande Dame on Rue de Rivoli feels more like a myth than an actual brick and mortar place where you pay to spend the night. After all, at Le Meurice, even the regulars can’t help but feel a bit awestruck. Dali was one of them, returning to the hotel’s jewel box interiors for over 30 years. Other reputable guests include the King of Spain , the composer Tchaikovsky, writers Orson Welles and Rudyard Kipling, and the list goes on and on. Le Meurice’s looks match the guest list. Once you enter the hotel’s interiors, it’s another world, one where 18th century designs, surrealism and over the top luxury combine to create a world that’s closer to fantasy than reality, and where the problems and norms of real life are checked at the door. Discover the latest addition of Alain Ducasse ! Be pampered at the intimate Valmont Spa that offers 3 treatment rooms, steam-baths and saunas. Everything was fine. I felt comfortable there. Top location and excellent service. For me he best hotel in Paris ! Cet hôtel et son personnel sont incroyables. L'emplacement et le cadre sont uniques à Londres; En fait, l'hôtel possède le deuxième plus grand jardin privé de Londres. Le premier est la propriété de Buckingham Palace. Le personnel est exceptionnel. Chaque personne que j'ai rencontrée mérite les plus grands éloges. J'espère vraiment y retourner !! Je vous remercie. A hotel of great tradition, well modernized, with breathtaking rooms, very fine ambiance and a lot of pleasant luxury. A wonderful hotel with impeccable service. Staying there with GLH only for the third time, I was again given a wonderful room overlooking the Tuileries gardens. At check-out my wife got two very cute birthday presents. And at the bar - one of my favorites in Paris - we were as always treated with utmost attention. A great place with a great, really dedicated staff! I thought everyone was so friendly, courteous, and professional. My friend visited me (she was staying at another hotel) and was greatly impressed with how friendly the staff was - especially compared to her hotel staff (she thought Le Meurice staff would be rather haughty, so was impressed that they were actually quite inviting instead). They happily took care of my many requests without any problems. Everything went smoothly. I was very impressed! A truly palatial hotel. I really enjoyed my stay thanks to the setting but mostly because of the excellent service. M. Barale is a central figure there and helped make my stay perfect. It is among the top 2 hotels I have stayed at (St. Regis Rome is the other) and I would rate Le Meurice a notch above based on service level. Everything was divine! The service stood out tremendously as the best I have seen and I travel extensively. It was warm and welcoming and very professional. I would especially like to mention Mr. Signorello. He had wonderful dining suggestions as well as sites to see and would make reservations on our behalf. He took much time and care to ensure we had a perfect visit. All whom we encountered were very proud of the hotel and their city and were happy to point us to their favorites and help us plan our days. The location was perfect. I will certainly be visiting again soon. One of the finest hotels that I have stayed at and will certainly stay there in future. No effort was too much and attention to detail was outstanding. Pure luxury! They gave us a courteous and pleasant welcome (including to our dog!) An unforgettable stay. One of the best hotels I have ever stayed at. Our stay can be rated as perfect. The staff of the hotel, in particular the valets, and the receptionists, were extremely kind. Definitely will stay there again. Amazing staff, the concierge was so helpful. Bar was warm and welcoming, staff as well. Very pleasant hotel, great service and a special mention for the breakfast which was delicious. Excellent hotel with very efficient and courteous staff. It is a magnificent hotel, the welcome is remarkable, and the staff is attentive and professional. When we reached there, we got a room upgrade, but there was a little problem with a tobacco smell in the toilets, so we have been upgraded again to a junior suite with view on the Tuileries park (without supplement) and we very much appreciated this directive. 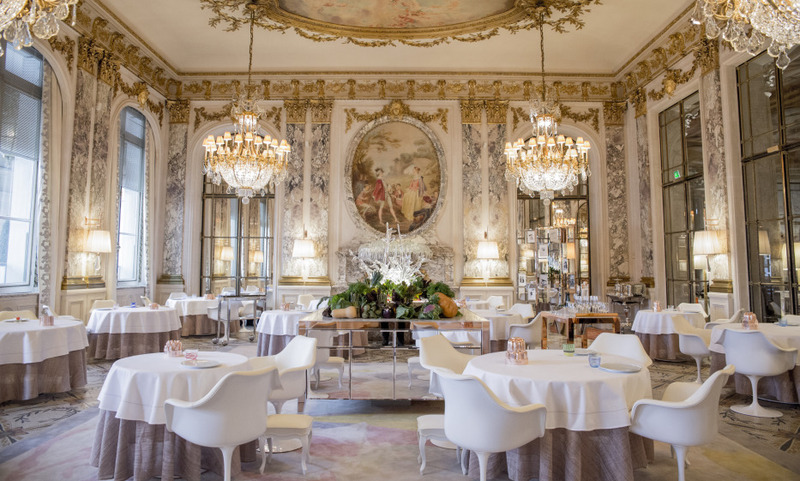 The restaurant Le Meurice is remarkable for both its gastronomic qualities and the quality of its service. Le Meurice is a wonderful hotel, at the height of its centuries-old history. Luxurious, elegant and refined with a staff friendly and informative. Certainly one of the best in Paris. Magnificent Parisian Palace, sweet smell inside the establishment and a more than competent staff to satisfy clients needs. I would go there again without hesitating. Classy as always and upscale service with a very friendly staff. Everyone tried their best to make sure we were comfortable and had our needs satisfied.